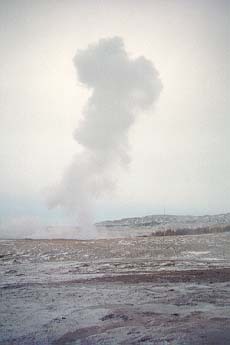 Iceland is home to the Geysir, from which all geysers are named. It is quiescent for the most part, although for special occasions, soap and other stimulants are thrown into it to get the old fellow spouting again. 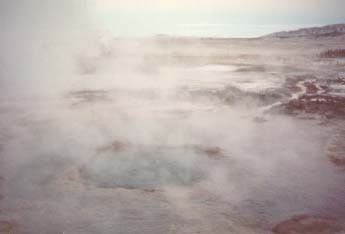 Geysir, though, is in the midst of an entire field of hot springs, bubbling pools, and bellows of steam. To do the honors for tourists is a geyser by the name of Strokkur (the churn), which conveniently erupts every several minutes. 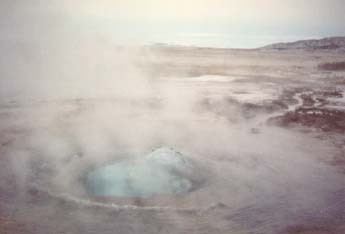 Strokkur begins quietly, looking no different from any other hot spring ready to boil you alive. The action begins with a big green bubble and blurp. And terminates with a roaring tower of steam, mushrooming some 50 to 80 feet above. Desmond Bagley's thriller Running Blind has a particularly good scene set in these fields. BBC-Scotland did a 3-hour version of it (also very good, starring Stuart Wilson) but left that bit out. A pity. Anyway, Running Blind has one of the best overall descriptions of Iceland and Icelanders (though written before the availability of beer in Iceland). No Icelandophile should be without it.